Wednesday, allowing him to leave the La Liga outfit ahead of a proposed move to London. Should the deal be completed, it would be more than the £66.8million Liverpool paid for Alisson in July and would also be a club record purchase, surpassing the £68 million million Chelsea spent on striker Alvaro Morata last summer. In Spain, a player has to buy himself out of his contract. The funds are then deposited with La Liga to trigger the release clause in the player’s contract before being transferred to the selling club. Ultimately Chelsea would pay the fee, though the London club has yet to publicly comment on the transfer. It has been widely reported that Kepa, 23, will replace Thibaut Courtois as Chelsea’s No.1 — the Belgian goalkeeper has failed to report for training in recent days. Real Madrid has been linked with Courtois, 26, though the Spanish club’s coach Julen Lopetegui refused to comment on the speculation during a press conference Wednesday. Spain No.2 Kepa, who has made one appearance for his country, could make his debut in Saturday’s Premier League game against Huddersfield if the deal goes through. 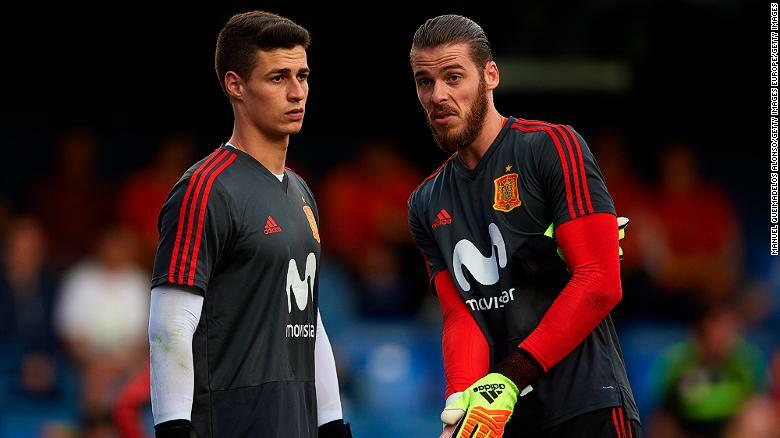 Kepa is behind Manchester United’s David de Gea in Spain’s pecking order. Visit cnn.com/sport for more news and videos. Kepa was on the verge of signing for Real in January for $21 million but then boss Zinedine Zidane pulled the plug on the deal. The young stopper consequently signed a new six-year deal with Bilbao which elevated his release clause to $91 million.